ROY G. POST was the founding chief executive of WM Symposia, the sponsor of the annual international WM Conference. 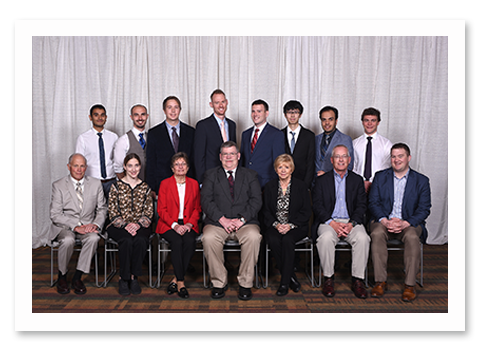 The Roy G. Post Foundation is a non-profit organization formed by his students, peers and protégés to provide scholarships to students to develop careers in the safe management of nuclear materials and to participate in the WM Conference. THE ROY G. POST FOUNDATION has awarded scholarships to more than 150 undergraduate and graduate students from all around the world. The recipients of the Post Foundation scholarships are a group of extremely accomplished and outstanding & driven students who excel both inside and outside of their academic role. The Foundation has provided over $3M educational support to students to attend the annual WM Conference. THE ANNUAL WM CONFERENCE, presented by WM Symposia (WMS), is widely regarded as the premier international conference for the management of radioactive material and related topics. WMS is a non-profit organization dedicated to education and opportunity in waste management. It was founded to provide a forum for discussing and seeking cost-effective and environmentally responsible solutions to the safe management and disposition of radioactive waste and radioactive materials. THE WM CONFERENCE was first held in 1974 in Tucson, Arizona. It was sponsored by the University of Arizona to assist the US Department of Energy (US DOE) in the management of high-level radioactive waste. Since then, it has expanded to other areas of radioactive waste and radioactive material management. The conference was held in Tucson until 2008 when it was then relocated to Phoenix and the newly completed Phoenix Convention Center. FOR MORE INFORMATION on the WM Conference, please visit www.wmsym.org.